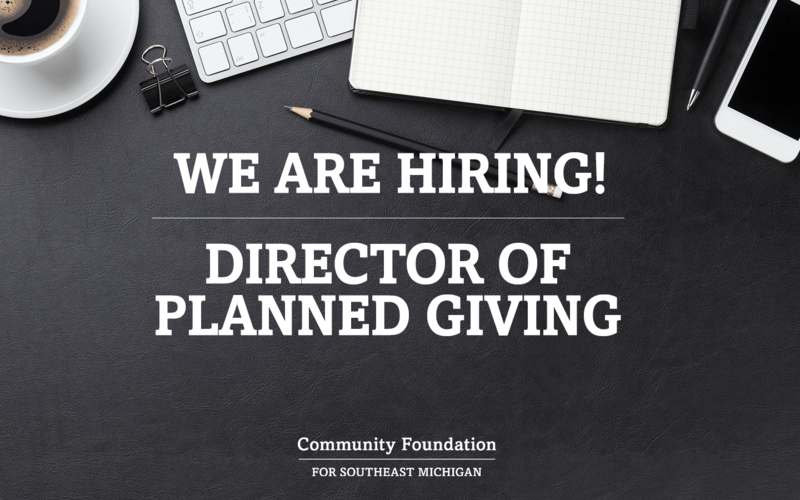 The Community Foundation for Southeast Michigan is searching for a Director of Planned Giving to join the Foundation’s philanthropic services team. The individual will assist individuals, foundations, corporations, advisors and non-profit organizations with current and planned gifts. Qualifications include law degree with experience in the areas of estate planning, personal tax and nonprofit /foundation law and active participation in state, national and local bar associations. Experience in nonprofit asset development or senior business development with proven success in working with large gifts is desirable. This individual will work with the entrepreneurial staff of the Foundation in supporting donor interests and developing programs to improve southeast Michigan. Identify, cultivate and secure current and future gifts to meet the annual and long-term funding objectives of the Community Foundation. Provide expertise and technical assistance regarding gift planning to prospects and other development staff. Develop and manage close coordination with attorneys and other professional advisors with a goal of establishing new and growing funds and planned gifts. Engage the Foundation’s Legal Financial Network and connect with the next generation of professionals. Develop a program to work with appropriate professionals and courts to provide assistance in court settlements. Review governance documents, including supporting organizations and legal issues relating to establishment of other agreements. Coordinate review of unusual gifts with the Gift Acceptance Committee. Actively participate in outreach of the Foundation, including public speaking and participation in professional groups. Serve as a liaison and resource for donors and prospective donors. Provide legal review of new products and initiatives as requested. Bachelor’s degree and law degree required, in good standing with Michigan Bar. Demonstrated success in donor stewardship, prospect identification, and solicitation. Fundraising experience, including proven experience to secure gifts of 6-figures or higher. Exceptional interpersonal skills, including oral and written communications and the ability to connect with diverse constituencies. Strong project management, research and analytical skills. Database proficiency; knowledge of fundraising/donor management software a plus. Proven success working in a multifaceted development environment. Entrepreneurial spirit with an appetite for collaboration. Send your cover letter, resume and salary requirements to Nancy Davies, Human Resources Officer at: careeropportunities@cfsem.org.